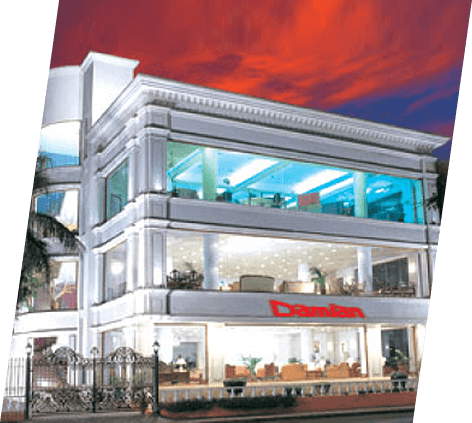 The Damian Group is an Indian conglomerate established in 1962 by Mr. Damian Pereira a tenacious entrepreneur with an innovative vision. The Damian Group has carved a dynamic niche in both the residential and commercial markets, where impeccable design constantly exceeds expectation. Our design expertise, flexibility and commitment to client collaboration over the past 50 years, has greatly contributed to our growth and evolution. Damian, the principle company of the group, has now become one of India’s premier Interior Design firms with a sprawling 25,000 sq. ft. showroom in Mumbai, Maharashtra and another 60,000 sq. 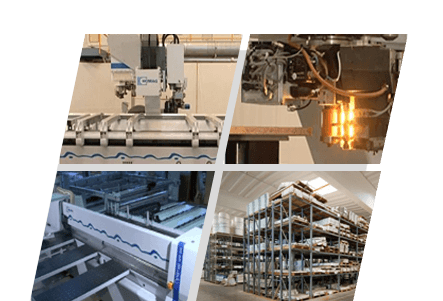 ft. in Porvorim, Goa along with Manufacturing Plants in both cities, equipping Damian with the means to handle projects of various sizes, scopes, and intricacies in multiple stages of development with optimum response time and efficiency. Our astute professionals have the experience to help you determine the products and patterns that work best for you in the surrounding colours and light settings while simultaneously providing a smart and spacious design that adapts to your expectations. Offices are being reinvented for the sake of increasing productivity and providing a futuristic experience for the employees to leverage their identity in the organizational circles. Office Interior designers in Bangalore have revamped the city of Bangalore since it is the most famous city as the IT sector of India. And since there are innumerable start-ups getting launched, every unique organization is adding their individualistic stripe to the design of their offices with the help of these insightful professionals. A well-structured team consisting of innovative designers, skilled artisans, dedicated workmen and experienced supervisors ensure the timely execution of projects given their extremely high stipulations. Our Diverse client pool sets us apart from the competition. They have carved a dynamic niche in both the residential and commercial markets, where impeccable design constantly exceeds expectation. Office interior designers in Hyderabad also don’t lag when it comes to inventing outstanding corporate surroundings. Everybody is adopting the mod styles and so are these experts. The landscape of Hyderabad is transforming with the adaptation of these stylish buildings and interiors. With a through emphasis on design, convenience and comfort, customized solutions are provided that prompt pleasurable customer experiences. 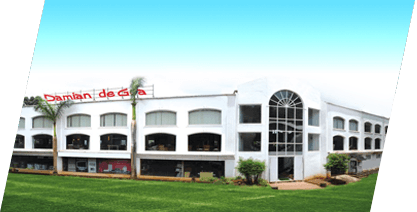 This unique concept of manufacturing every requirement under one roof is backed by state-of-the-art manufacturing facilities equipped with CNC machinery capable of producing custom made components to maintain those high standards. Interior designers for office in Pune are not far behind when it comes to delivering quality solutions for commercial spaces. The astute professionals have the experience to help you determine the products and patterns that work best for you in the surrounding colours and light settings while simultaneously providing a smart and spacious design that adapts to your expectations. Their design expertise, flexibility and commitment to client collaboration over the past 50 years, has greatly contributed to the growth and evolution. At Damian Corporate we deliver on our promise of excellence. No matter the size or stature of the project, presenting the client with a premium solution is the primary responsibility. Damian Corporate boasts company owned warehouses to store the material and fleet of vehicles for careful transportation of material to the respective sites. Damian Corporate has long been the most forward thinking and innovative company in the industry. The Damian Corporate Family has the advantage of an experienced team with a unique ability to work as a unit while bringing out the reliable attributes of each individual. Over the past 50 years Damian has constantly pushed the boundaries of creativity and comfort to provide ground breaking products of the highest quality to its customers. Damian Corporate is currently a 50 member strong team and growing. We believe that this is the most vital aspect in any Industry and this team has successfully demonstrated that with our several relationships. Mutual interests are well understood. Our Clients & Partners are proactively handled and addressed It is no secret why we are known for our long standing relationships. We leverage our relationships of four decades. Over the last 40 years, Anselm has spearheaded the Damian Group in building an unshakable reputation for quality, efficiency, trust, timely completion and handing over of projects. Craig is a double Graduate in Business Management & Interior Design. He joined Damian over 12 years ago & since then has robustly contributed to the diversification & growth of the Business. Kyle is an innovative and dynamic third generation entrepreneur with limitless aspiration and aggressive ambition. A qualified Architect by profession, who has an impressive portfolio of extensive work completed during his time with reputed real estate giants like; The WadhwaGroup & Radius Developers. Anjali is a B.Com, PG DBM (with specialization in Marketing), LL.B who has 24 years experience in the field of Sales & Marketing, of which 20 rich years is in the Furniture Industry.